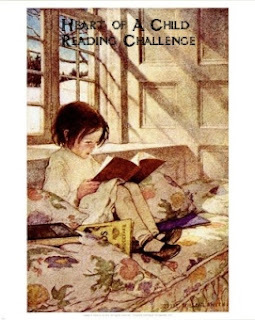 What could be more charming than a lovely reading challenge called The Heart of a Child? It's all very simple. Choose 3 to 6 books that you read as a child (any age up to 18) that you would like to revisit. Read them between the 1st. February and the 14th. July 2008. Comment occasionally on your progress. The challenge is being run by Becky at Becky's Book Reviews and the link for the challenge is here. I've chosen a pool of six books to read from, books I absolutely adored as a child. 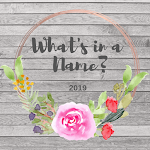 Just one is overlapped with another challenge and that's Anne of Green Gables which I'm also reading for the What's in a Name challenge. I thought I would get briefly away from my usual fantasy or ghostly short stories and try something else for a change. These two stories come from The Penguin Book of Modern Women’s Short Stories edited by Susan Hill. I’m not really sure what the point of making the boys black was in this story. It seemed like it was just done for effect as at no point did their colour seem to have a lot of significance. To be honest, this is a story about a marriage. How some women can feel completely lost when their children leave home and how by doing something like this couple did, the woman and the whole marriage can change, perhaps not dramatically, but enough to make things better for all concerned. Interesting but not rivetting. The second story, picked at random, was Summer Picnic by Elizabeth Jane Howard. Five pages long, at first glance it seems to be a simple story about a picnic. It’s not at all of course. You soon learn that three generations of women are here, one, Lalage, aged seventeen, exitedly awaiting something that’s going to happen, her mother and grandmother, remembering. That’s all I’m going to say. The story is a gem, short and sweet, but all you need to know is within these five pages. I've been tagged! Susan at Bloggin' 'bout Books tagged me for Eva's book meme. It was quite challenging and I had to think quite hard about some of the answers. Russian literature in general. I tried to read Dr. Zhivago years and years ago and found I couldn’t cope with the names. Ever since, I’ve shied away from all books by Russian authors. Pretty silly really. (Borrowing shamelessly from the Thursday Next series by Jasper Fforde): You are told you can't die until you read the most boring novel on the planet. While this immortality is great for awhile, eventually you realize it's past time to die. What book would you expect to get you a nice grave? This is such a difficult question as I’m very loathe to brand any book, ‘the most boring novel on the planet’. But one book I just couldn’t get through no matter how hard I tried was The Last of the Mohicans by James Fennimore Cooper. I found his style too rambling and really heavy going. A shame – I love the movie! Come on, we've all been there. What book have you pretended, or at least hinted, that you've read, when in fact you've been nowhere near it? I tend to be boringly honest about the books I’ve read so I can’t think of an answer to that one. As an addition to the last question, has there been a book you really thought you had read only to realize when you read a review about it/go to "reread" it that you haven't? Which book? Yes, I realised last year when I was doing the RIP challenge that I hadn’t read Dracula. I honestly thought I had but it quickly became apparent I hadn’t. This is such a hard question as it really depends upon the person, what sort of interests they have, whether they’re male or female. I’d probably be inclined to hand over something like The Diary of Anne Frank because I think it’s a book everyone should read. Russian. I learnt some at school and found it fascinating but was unable to continue as the course only ran for a few terms. Perhaps if I could read the language fluently I wouldn’t have such a mental block about the literature. A mischevious fairy comes and says you must choose one book that you will reread once a year for the rest of your life (you can read other books as well). Which book would you pick? Another hard one. I’d be quite happy to read the book but choosing *one* would be very difficult. The Earthsea Quartet by Ursula K. Le Guin, perhaps, which I have in one volume. Grass by Sheri S. Tepper. The three ‘Harper Hall’ books by Anne McCaffrey if they were in one volume. The Vizard Mask by Diana Norman. The Complete Sherlock Holmes! Choosing one book is almost impossible. I know the book blogging community, and all its challenges, have pushed my reading borders. What's one "bookish" thing you discovered from book blogging (maybe a new genre, or author, or new appreciation for cover art - anything)? I’ve learnt to push the boundaries of my reading. I’ve always been a fairly eclectic reader but now I’m even more so because I’ve discovered that some authors I thought were ‘difficult’ are not if you’re willing to concentrate and spend the time. It’s been good discovering that I’m not peculiar in my book tastes after all, that there are plenty of others varying their choice of books just as I do. The good fairy is back for one final visit. Now, she's granting you your dream library! Describe it. Is everything leatherbound? Is it full of first edition hardcovers? Pristine trade paperbacks? Perhaps a few favorite authors have inscribed their works? Go ahead - let your imagination run free. My dream library would of course have the obligatory comfy armchairs and roaring fire. But no, I wouldn’t want first editions or leatherbound tomes. I’d just want huge numbers of well thumbed books. Plenty of travel books, beautifully illustrated children’s books, a really good sci fi and fantasy section, plenty of ghost anthologies. Oh and masses of history books and biographies, natural history etc. There would need to be room for a computer somewhere and a big jig-saw puzzle on a table in the middle of the room for people to dawdle over when they fancied. It looks like I’m going to need a fairly big room for this and it would need to look out on a lovely garden, full of flowers, or maybe a long sweeping lawn running down to a river. I've always fancied living in an old vicarage so perhaps I could have that too to put the library in? I'm no good at tagging people so if you would like to do this then please do. I suddenly realised that I was close to the end of January and the finish of the Seafaring challenge. As I still have one book to read I set Kim aside for later (barely started anyway) and started on The Whale Road by Robert Low. I'm about 80 pages in and struggling. I can't decide whether I can't concentrate because real life is a little difficult at the moment or whether I genuinely don't like the book. It's an historical about Vikings and very 'blokey' if you know what I mean by that? A lot of blood and gore and such, I even had dreams about it the other night and not very nice ones either! Actually, I could settle for three books for this challenge as it isn't one where you 'have' to read a set number of books. We'll see. I think it may be a time when I need to read whatever I fancy rather than force on myself something that I'm just not in the mood for. I have said that the cross mail conveyances in Canada did not seem to be very closely bound as to time; but they are regulated by clock-work in comparison with some of them in the United States. 'Are you going this morning?' I said to a mail-driver in Vermont. 'I thought you always started in the evening.' 'Wa'll; I guess I do. But it rained some last night, so I jist stayed at home.' I do not know that I have ever felt more shocked in my life, and I could hardly keep my tongue off the man. The mails, however, would have paid no respect to me in Vermont, and I was obliged to walk away crestfallen. LOL! A joy of a read. These are just selected writings and I think I may have to see if the actual book of his travels in the USA and Canada is available to buy. One of my New Year's reading resolutions was to read more short stories. I have loads of anthologies on my tbr mountain but for some reason I've ignored them for years. I think maybe it was because I was so intent on collecting numbers for my final 'yearly total of books read' that I just wouldn't stop to read an odd short story here and there. This year I decided that was ludicrous and that things would be different. I know it's only a couple of weeks into 2008 but already I feel like a different kind of reader. So... here're some thoughts on a couple of stories read this week. 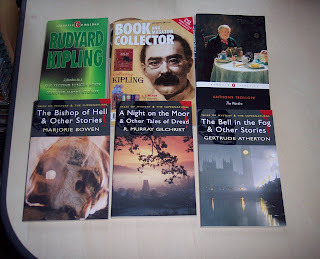 They by Rudyard Kipling was my first story for this week. It's a supernatural story. Or is it? This is such an ambivalent piece of work that it's hard to tell. The narrator is driving around Sussex in the early days of the motor car. He takes a wrong turn and goes careering down a steep hill in some woods and finishes up in the garden of a large and beautiful house. There are many children, at least he can hear them and catches brief glimpses but... The house is owned by a blind woman and he is made welcome and returns several times. It was hard to know what to make of this one but I liked it for its 'other-worldliness'. Nice atmosphere. The story is available to read online here. Uncle Dobbin's Parrot Fair by Charles De Lint is the first story in his Dreams Underfoot anthology. It's part of the author's 'Newford' series of books; they're 'urban fantasy' and completely new to me. It's hard to know how to describe this one as it meanders all over the place and you're never quite sure what's real and what isn't. A woman called Ellen picks up a punk youth after he's been beaten up and discovers that 'something' is shadowing him. Ellen likes to read an author called Christy Riddell who writes down myths and legends and talks of things that don't exist. Or do they? As I said, it's hard to know. And, once again, I liked that ambivalence. I've just started the second story, The Stone Drum, which takes place within one of Riddell's books and concerns one of De Lint's ongoing characters, Jilly Coppercorn. I have a feeling I'm going to really love this series and universe. 1. For some reason I've started reading several books at once where once I used to be a strict 'one at a time' person. So, downstairs in the sitting room I'm reading Kim by Rudyard Kipling, though I haven't got very far with it yet. In the bedroom I have a book of travel writing by Anthony Trollope which I'm really enjoying. And here in my study I have a book of short stories by Kipling and Dreams Underfoot, an anthology by Charles De Lint. I'm midway through the second story of the De Lint and having to stop myself picking it up at every opportunity as it is just gorgeous. 2. A cd called American Tune by Eva Cassidy. My favourite songs on it are, The Water is Wide, Dark Eyed Molly and You Take my Breath Away. Her voice is so beautiful - I can't believe she's no longer with us. 3. Tonight we watched Masterchef on BBC2. This is a cookery show where people compete for the title of masterchef. I'm in awe of anyone who would put themselves to the test like this. After that there was nothing that interested us so we watched A Scandal in Bohemia, a Sherlock Holmes mystery from my new boxed set. A book review before I really get into my rambling stride. Like an idiot I hadn't realised there was a Sherlock Holmes book where the two of them met! I suppose I thought they had known each other since school days or something. Not so. And A Study in Scarlet is the book where it's explained that they took up lodgings together after Watson came home from Afghanistan, and didn't actually know each other previously. It's wonderful how bemused poor Watson is by his unusual house-mate and how he strives to get to the bottom of what it is that Holmes does for a living. When he eventually discovers the answer he then finds himself embroiled in investigating the murder of a man called Drebber from Cleveland, Ohio. Watson is astonished at some of Holmes' methods but, when the case is brought successfully to a conclusion, has to admit that they work. The last third or so of the book deals with the back story of how Drebber came to be murdered and takes place in Utah. It then moves back to London for Holmes to explain how he solved the case. I don't know why I've never read this before. I wish I had as it explains a lot but it's also a really good read. Not perhaps on a par with The Hound of the Baskervilles but not bad. When the story moved to Utah I thought it might not be as rivetting but in reality it got even better! The tale of skulduggery in the Wild West reminded me a bit of the anthology I've just read by Ambrose Bierce. I wasn't that struck by that so why I liked Conan Doyle's version a lot more I'm not sure. As I said, I'm nothing if not contrary. You know how it is when you see a magazine in the newsagents and it speaks to you? You don't normally buy that magazine (well, only occasionally) but somehow you just have to have it? This month's 'Book and Magazine Collector' was one such. It has a picture of Rudyard Kipling on the front, which shouldn't have been all that significant but having watched the TV drama, My Boy Jack, very recently, it was. Kipling is an author I've read bits of... Puck of Pook's Hill and its sequel, the Just So stories, various other supernatural short stories and poems (I don't know a lot about poetry but have always loved, 'The Glory of the Garden' and 'The Way Through the Woods') and I'm currently reading Kim for the What's In a Name? challenge. So, his writing is not completely unknown to me. To digress for a second, coming to the end of 2007 I felt that, yes, it had been a very good reading year but that something was missing - and that was that I hadn't learnt an awful lot. Partly, I hadn't read enough non-fiction, but not just that, there was no one author I'd covered well, not just his or her fictional writing but their non-fiction writing as well and books *about* them - their lives, in other words. This is a new experience for me, I've never been particularly bothered by this before but suddenly I am. And when I saw that magazine something went 'click'. Kipling - I should find out about Kipling. So, I'm going to. That magazine will be a start and there's loads online that I discovered just by Googling his name. To tell the truth this may take me nowhere and I may get bored within a few weeks. On the other hand I might not and I may get to the end of 2008 and be very pleased that I took the trouble to find out about just one author and learn *something*. This is the first proper book of 2008 for me. Even though I started it before the 1st. January the majority of it was read this year. And it's taken me a while! Not the book's fault but mine - I've just been so busy since the new year started. Anyway, what a cracking read for the start of a new year! 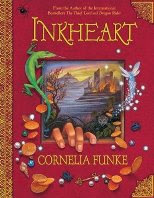 I've been tempted by Inkheart by Cornelia Funke several times in the library but never actually brought it home. But, inspired by a post by Deslily about the new movie of the book, due out in March, I decided it was time I read it because it looks like a movie I will love and want to see. This is, in fact, a book about books. About people who love books, about people who obsess over them and also about people who have no understanding of books whatsoever. 'All life is here' as they say. Twelve year old, Meggie, lives with her father, Mo. They move around a lot and Meggie is not sure why. Her father is a bookbinder with an overwhelming love of books but he has never read out loud to her; again, she doesn't know why. One day she looks out of the window and a rather disreputable looking man is standing there watching the house. This is Dustfinger. Meggie takes an instant dislike but it's clear he knows her father very well indeed. Suddenly they are on the move again and Meggie, her father and Dustfinger go to stay with Aunt Elinor, a rather forbidding woman with more books than Meggie has ever seen in her life. Elinor cares more for her books than she does for people and she - and Dustfinger - are curiously obsessed with a book Mo carries around with him, Inkheart. Meggie sets about finding out what is so special about this book but her investigations are interrupted when her father is suddenly kidnapped. Dustfinger appears to know more than he's willing to tell and Meggie and Elinor persuade him to set off with them in hot pursuit of the kidnappers. That quest brings Capricorn and his minions into their lives. He is about as frightening a man as it's possible to meet, but where has he come from? And why is *he*, an illiterate, also obsessed with the book called Inkheart? And what *is* it that's so special about Meggie's father, Mo? What can he do that others can't? This is one of the new breed of young adult books that's so prevalent at the moment. The genre is fair brimming with talented new writers, Garth Nix, Trudi Canavan, Joseph Delaney, Christopher Paolini, Angie Sage, the list is endless. Now add Cornielia Funke to said list because I really loved Inkheart, which is the first in a series, although I'm not sure what the series is named. The plot gallops along at a great rate of knots, no hanging around here as you career around the countryside of er... well, I *think* it's Italy but I'm not sure it was ever stated. It's a pageturner really, and I can see that it would work really well on the big screen. I *hope* it will encourage both children and adults to take up reading when they see the film and I personally can't wait to see Elinor's library! In the book I liked the way each chapter begins with a quote from children's classics such as Jungle Book, Peter Pan, Huckleberry Finn and so on. It's as though the author is acknowledging a huge tradition of children's writing and the contribution that that has made, not only to her life, but to her own writing as well. Nicely done. This challenge runs all year and the post for it is here. 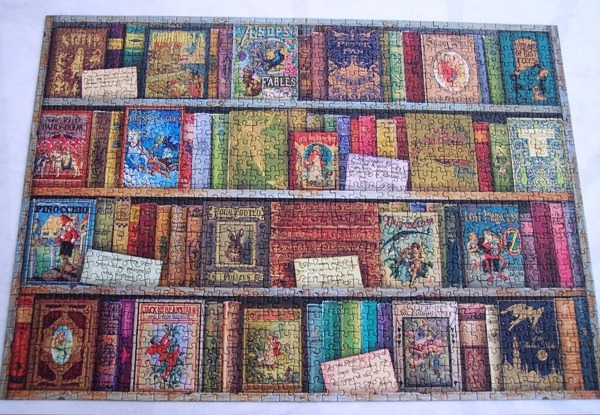 I've just come across this challenge while wandering round the book blogs and as I have a handful of dragon books on my tbr pile I thought I would give it a go. The challenge is to read 3-5 books that are dragon related from the 1st. January to the 30th. June 2008. The link to the challenge, which is being run by Love at Stray Talk, is here. Two short catch-up reviews of books read over the Christmas holidays, when I tend to go for easy reading. First of all, The Uncommon Reader by Alan Bennett. My youngest daughter gave this to me for Christmas. I couldn't have been more delighted as I'd already given it to a friend as a Christmas gift and had decided to buy it for myself after Christmas. I'm not going to say too much about it, mainly because it's quite a short little book and anything I say would probably spoil it for other readers - assuming there's anyone left who hasn't already it! Basically, the Queen takes up reading when she comes across the mobile library outside the palace. One book leads to another as they tend to and... well the result is an utterly charming, beautifully observed and funny read. I loved it and plan to read it all over again soon *and* try to read more of Alan Bennett's work, which I tend, sadly, to neglect. I was a bit disappointed by A Moonlit Road and other Ghost and Horror Stories by Ambrose Bierce. I've read so many good ghost anthologies in the past and was hoping for the same from this famous author; it turned out I just wasn't all that struck. One or two stories stood out - The Man and the Snake was a creepy tale of what happens when you wake in the middle of the night and find there's a snake in your bedroom. I think it helps to be as afraid of snakes as I am. *g* And The Secret of Macarger's Gulch was an atmospheric tale of skulduggery in the American west. But otherwise the anthology was a bit average and I'm left wondering if it's not perhaps representative of the best of Bierce's work.